The top four players by wins above replacement in the lower half of the NBA’s Eastern Conference, from left to right: Joe Johnson, Deron Williams, Channing Frye, Carmelo Anthony. The NBA season approaches with the rolling thunder of a Shaquille O’Neal coast-to-coast dunk. 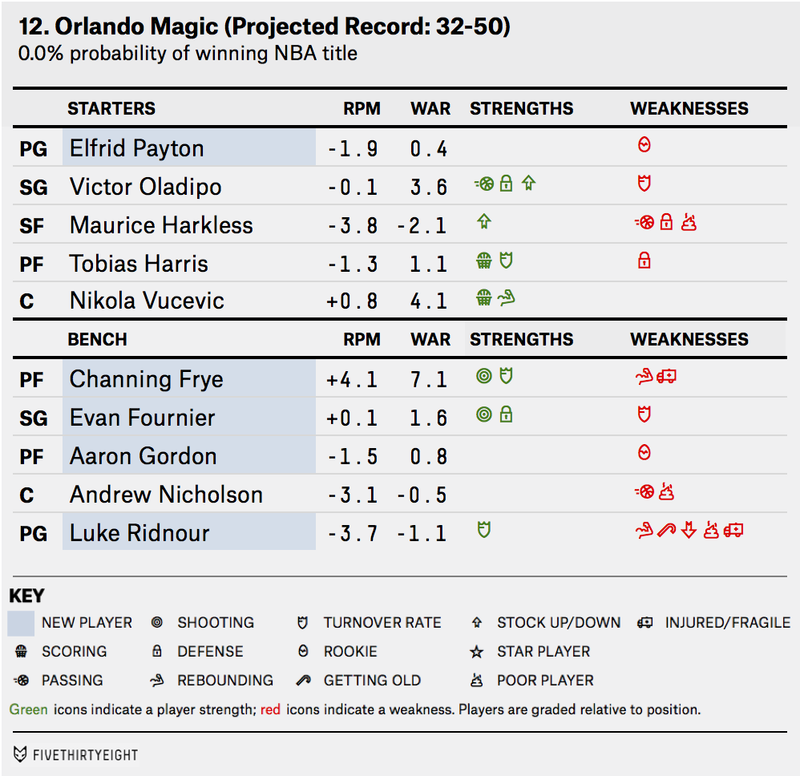 We felt the footsteps coming weeks ago, and took each NBA player’s projected Real Plus-Minus and wins above replacement, calculated a total for each team, and ran 10,000 simulations of the NBA schedule to divine likely records and championship odds.1 We’ve split the teams into the lower and upper tiers in each conference; these are the seven teams that likely won’t make the playoffs from the East. (We previewed the West’s lower and upper tiers here and here.) Use our stats, x-factors and regressions to prepare before Tuesday night arrives. 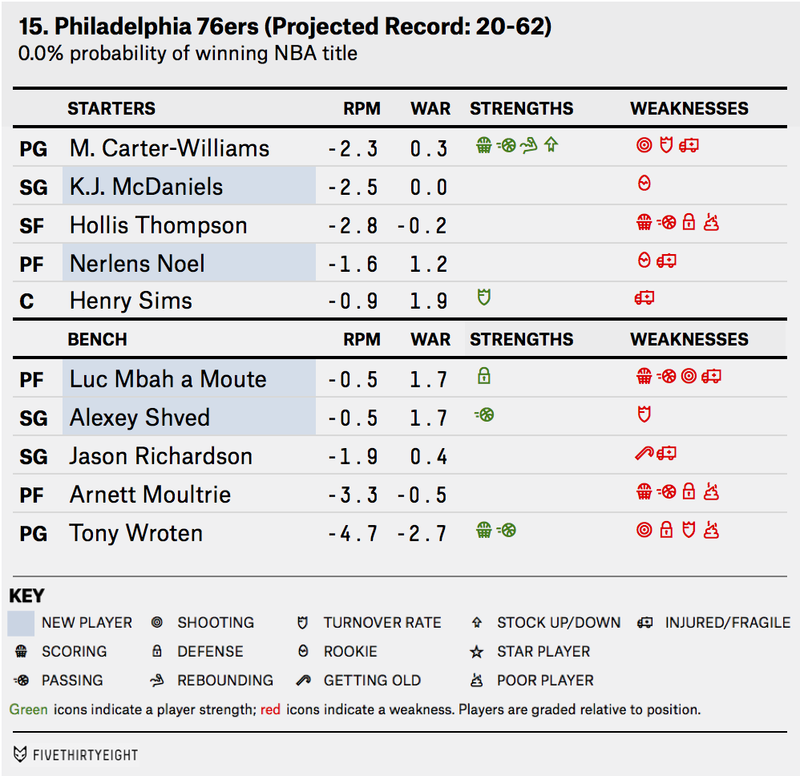 The Philadelphia 76ers were terrible last season. They will almost certainly be terrible this season. And yet, they’re getting better. 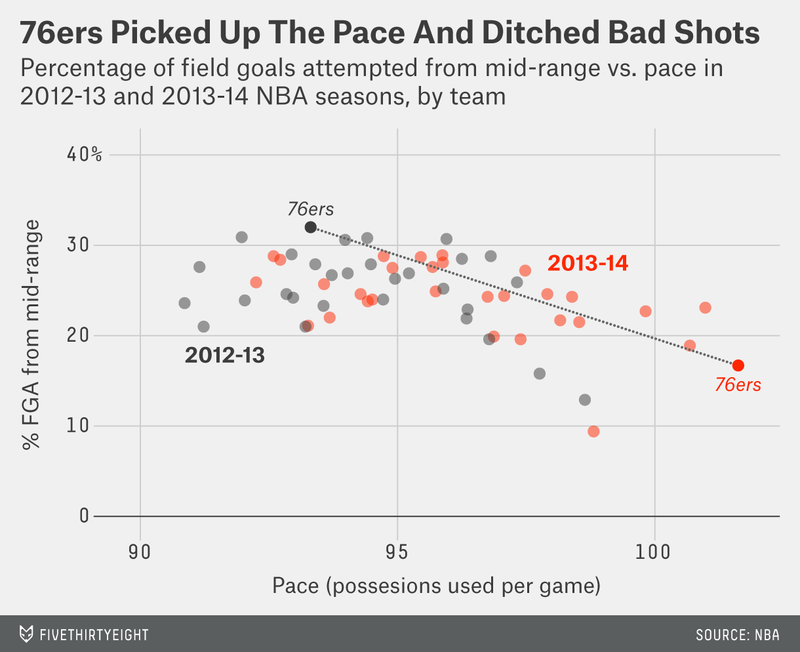 You can see how much movement there was from the 76ers last season — they pushed themselves to the league’s extremes in both pace and shot distribution. The Sixers may not have found their franchise player yet, but they do know how they want the pieces around that hypothetical future star to play. Sixers ball is now up-tempo ball, with lots of defensive pressure and an efficient distribution of shots by the team’s role-players. The Milwaukee Bucks were a disaster on defense last season, allowing 108.9 points per 100 possessions, the second-worst mark in the league. That was a huge slide from the 2012-13 season, when the team had the league’s 12th-best defense, allowing just 102.3 points per 100 possessions. Many of the Bucks’ problems could be traced back to the basics of defense — forcing misses and then rebounding those misses. The Bucks ranked 28th in opponent expected field goal percentage, and they weren’t picking up the few baskets their opponents were missing: They ranked 29th in defensive rebounding percentage. Blame the absence of Larry Sanders. Two years ago Sanders was a breakout star, becoming a hugely important interior defender for the Bucks. He was one of the two best defenders in the league over the past two seasons at keeping his opponents’ effective field goal percentage in check, according to basketball stats blog Got Buckets’ adjusted Four Factors ratings. Sanders’s defensive performance didn’t really change last season. 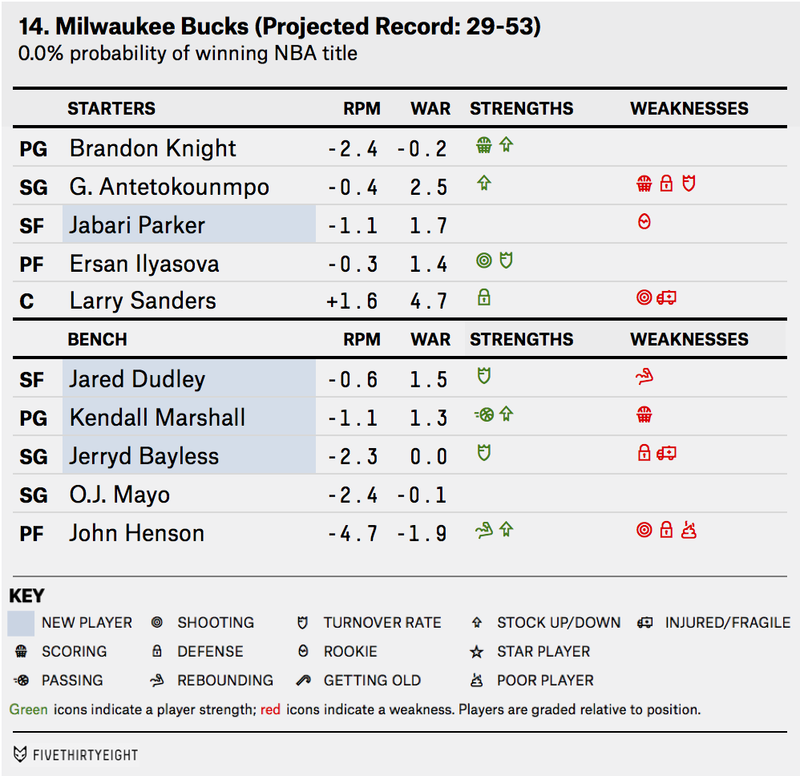 The Bucks defense was 4.9 points better per 100 possessions when he was on the floor, and the NBA’s SportVU Player Tracking system calculated that opponents shot just 41.5 percent at the rim on shots he defended. That was the third-best mark in the league among players who defended at least five shots at the rim per game. But to defend, a player has to be on the court. And Sanders was not, playing 584 minutes across 23 games. The missed time came because of two injuries (one of which came during a fight at a night club), and his season was capped off with a five-game suspension for violating the league’s anti-doping program by using marijuana. Last year’s New York Knicks were an overpaid, overrated mediocrity with a nominally disappointing 37-45 record2 that would ultimately cost coach Mike Woodson his job. What followed was an offseason of upheaval; legendary coach — and former Knick — Phil Jackson signed on as the team’s new president of basketball operations, and after a dalliance with Steve Kerr (his former point guard with the Chicago Bulls) Jackson eventually hired Derek Fisher (his former point guard with the LA Lakers) as the Knicks’ 26th head coach. An acolyte of Jackson and his longtime assistant Tex Winter, Fisher is bringing the fabled triangle offense to New York, emphasizing ball movement, court spacing and unselfish decision-making. 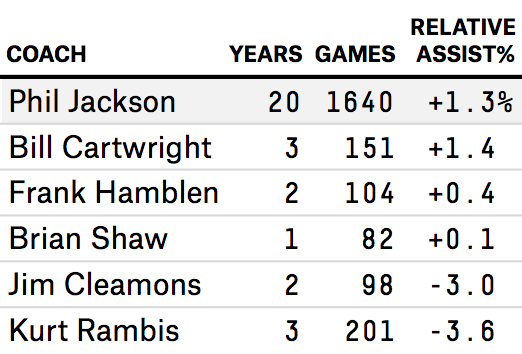 Those are all good ideas (for any offense), and historically speaking Jackson-coached teams were perennially above the NBA average in assist rate.3 But only one member of Jackson’s coaching tree — Bill Cartwright — has successfully convinced his players to share the ball anywhere near as much4 as Jackson did when he was a coach. It remains to be seen if Fisher’s version of the offense can buck this trend and promote the kind of passing to which triangle coaches always seem to pay lip service. But he’ll have his work cut out for him with these Knicks. The 2013-14 version of the team finished 27th out of 30 teams in assist rate, with frequent complaints about the lack of ball movement hurled in Woodson’s direction by the New York press. These were not your Red Holzman-era Knicks. By trading Arron Afflalo and Jameer Nelson, the Magic seemed to make their intentions clear: develop their youthful core, build through the draft and forgo short-term wins for the promise of success down the road. Then, somewhat puzzlingly, the team signed Channing Frye, who is coming off the best season of his career, to a contract that will last until he is 35. The Magic are a jumble, but the most important thing they can do this season is figure out which of their nine players on rookie deals fits the long-term plan. The most likely to last is Victor Oladipo. Last year, he struggled to play efficiently as the primary ball-handler in his rookie season. His 19 percent turnover rate was the third worst among starting NBA guards, and he shot only 33 percent from three. But Oladipo got to the free-throw line (with a 35 percent free-throw rate) and defended well on the perimeter, meaning that if he can improve his shooting and ball-handling, he will make strides towards better offensive efficiency this season. After Oladipo, things get a little more complicated. Up front, Tobias Harris and Nikola Vucevic figure to see considerable minutes with Frye. Both are entering their fourth seasons in the NBA and have shown the potential to be fine rotation players. Harris5 is a very strong rebounder for a player of his size (20 percent defensive rebounding rate despite being 6’8”), and he also almost never turns the ball over. But he can’t shoot (he’s never made more than 31 percent of his threes in a season), and in a league that increasingly prizes stretch fours, that is a big limitation. Vucevic has quietly become one of the best rebounders in the league. Last season, he finished 10th in defensive rebounding rate, 13th in offensive rebounding rate and, according to SportVu, 13th in rebounding chances.6 Vucevic is also an excellent mid-range shooter, making 45 percent of his 2-point jump shots at least 10 feet away from the basket. But the Celtics do have a rare combination in Kelly Olynyk: a 7-foot starting center who doubles as a 3-point threat. There are great long-range shooters who are tall (Kevin Durant, say), but not Kelly Olynyk-tall. Since 1980, the league-wide average (weighted by minutes played) of all shots that are 3-pointers rose steeply until the line was moved back in 1997, only to resume its seemingly inexorable rise. For centers, the 3-pointer share has been much, much lower, and the climb has been less steady because of the small sample sizes. 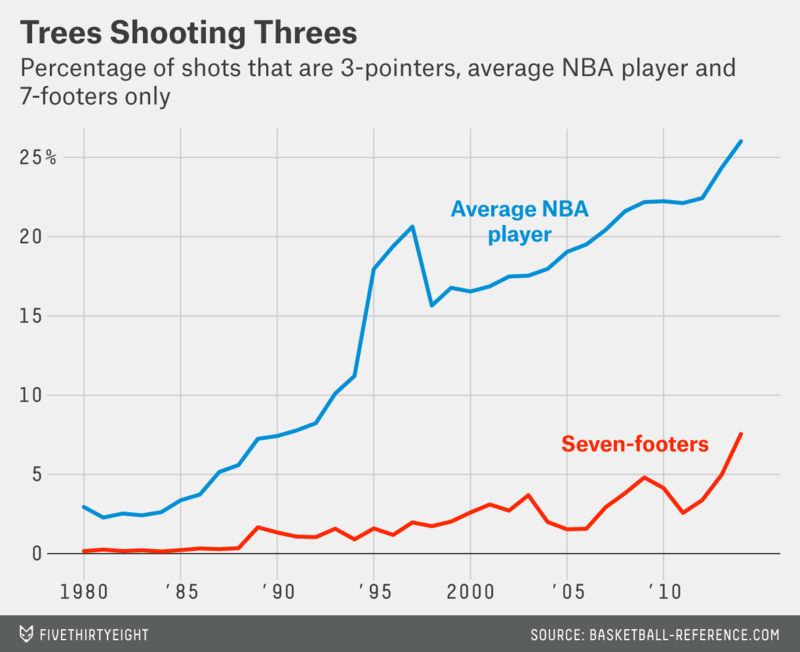 Yet something interesting has happened in recent years: Seven-footers are taking more threes. The rate nearly tripled between the 2011 season average of 2.6 percent and last season’s record-shattering high of 7.6 percent. Of 7-footers last season, five binged on the long ball: Spencer Hawes, Donatas Motiejunas, Andrea Bargnani, Dirk Nowitzki and Olynyk. Each attempted more than 20 percent of his shots from behind the arc. Bargnani and Motiejunas hit less than 30 percent of their threes, while Olynyk hit 35 percent, Nowitzki hit 40 percent and Hawes hit an impressive 42 percent (good for 10th-best in the league). Now, this is not a widespread phenomenon: Most 7-footers do not shoot from long range, but the few who do are doing ever more of it, and Olynyk is the youngest and latest incarnation of the trend. The Detroit Pistons dropped $13.5 million on three players — D.J. 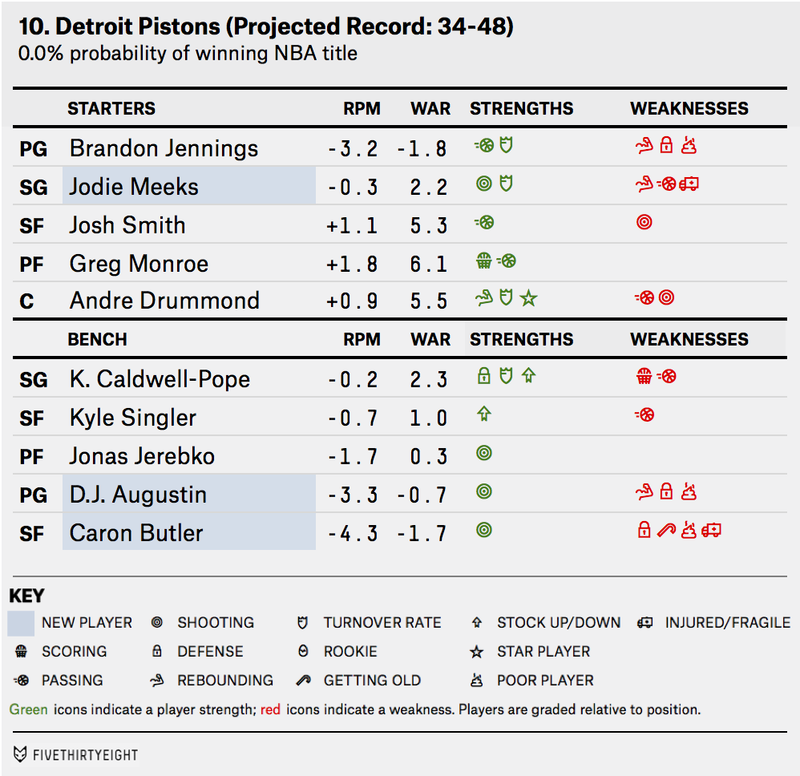 Augustin, Caron Butler and Jodie Meeks — who have severe limitations. 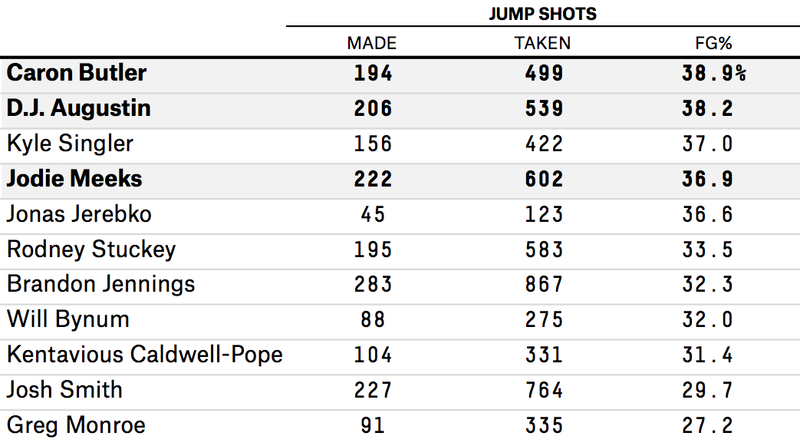 The one thing they all can do: consistently make jump shots. Outside shooting is the lifeblood of offensive efficiency, not just because of the points it yields, but because of the way it stretches the defense and creates space for every offensive player. 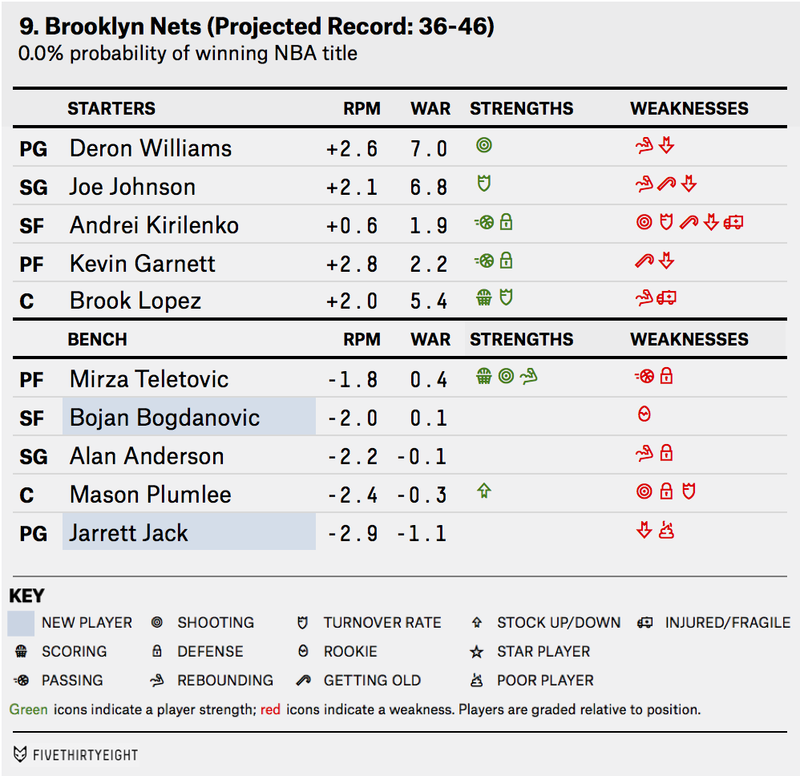 It’s hard to imagine more going wrong for the Brooklyn Nets than what transpired last season. A tumultuous coaching turn by Jason Kidd (who bolted to the Milwaukee Bucks after a failed coup in June), the season-ending injury suffered by center Brook Lopez in December, the banged-up struggles of putative franchise player Deron Williams and the sudden collapse of Kevin Garnett’s game9 made it fairly astonishing that the ancient, staggeringly expensive Nets were even able to advance to the second round of the playoffs. Now Brooklyn has a new coach in Lionel Hollins, a (marginally) younger roster with 37-year-old Paul Pierce gone, and a surprisingly strong front-court duo in Lopez and second-year big man Mason Plumlee. But as was the case when they acquired him from the Utah Jazz in 2011, the Nets’ ultimate fate lies in the hands of Williams, a point guard with the talent — and salary — of a superstar, but not always the durability or production to match. Williams has always been of particular interest to statheads because he was so easily compared to 2005 rookie classmate Chris Paul. Drafted one pick apart,10 both burst onto the scene with instant success; Paul thrilled nerds by generating absurdly good advanced stats at a young age, while the bigger, sturdier Williams became the traditionalist’s choice after leading the Jazz to four playoff series wins in his first five NBA seasons. It was a classic dichotomy: the player with the gaudy stats against the player with the eye test and postseason résumé on his side. It would have been easy to write off Williams at that point as a flash in the pan, overrated early in his career by the halo effect of running the offense for a team that made a few moderately deep postseason runs. But Williams defied that easy story line, bouncing back with a fantastic 2012-13 performance that was vital to the Nets’ return to the postseason. 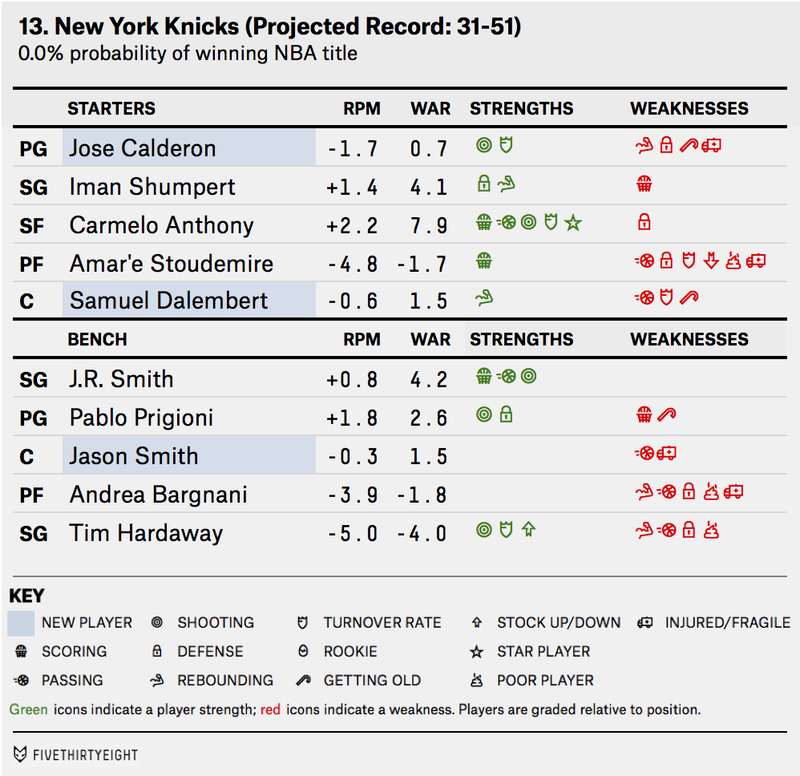 To the general public, at least; statistical systems like ESPN.com’s SCHOENE were (rightly) quite bearish on New York before the season began. The percentage of a team’s made field goals that were assisted. Relative to the league-average assist rate. Who is Channing Frye’s cousin! Defined as the percentage of times a player gathered a rebound when the ball was within 3.5 feet of him. 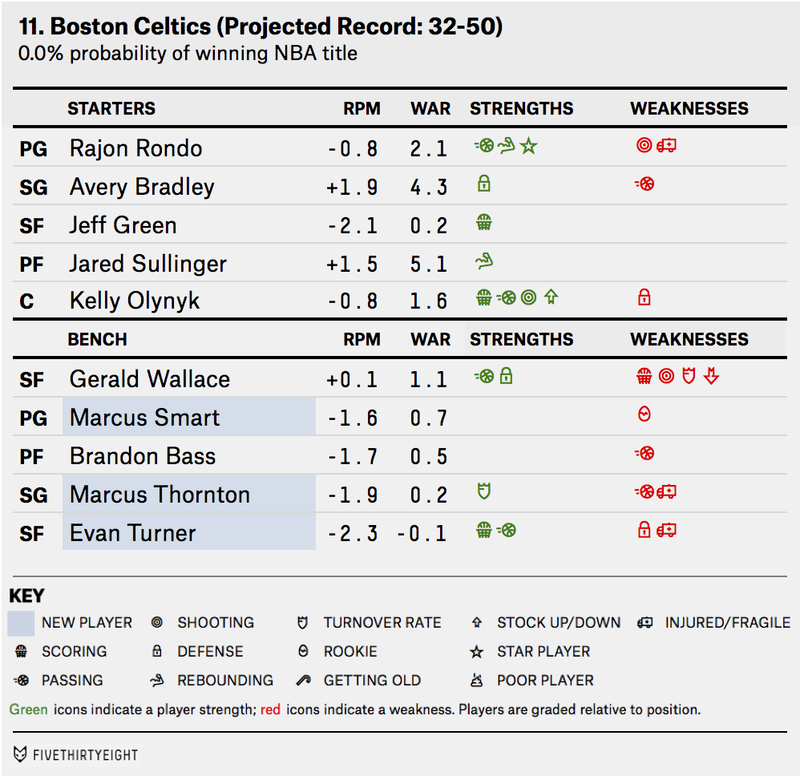 This projection uses Real Plus-Minus ratings for each player, which are then aggregated to forecast the team’s win total. Meeks could miss as much as eight weeks recovering from a preseason back injury. But not exactly unexpected — I mean, he was 37 years old. Williams went third overall, Paul went fourth. After he allegedly played a role in the abrupt resignation of longtime Jazz coach Jerry Sloan.